Ideal weight distribution for the long haul. School bus routes come in all shapes and sizes: short and hilly, long and bumpy or all of the above. The Saf-T-Liner® HDX from Thomas Built Buses is built to handle them all. This model is designed to keep drivers comfortable, with features like standard tilt and telescoping steering wheel and optional adjustable pedals. It offers a pleasant ride for up to 90 passengers with air conditioning, coach-style seating and heavy-duty shock absorbers. 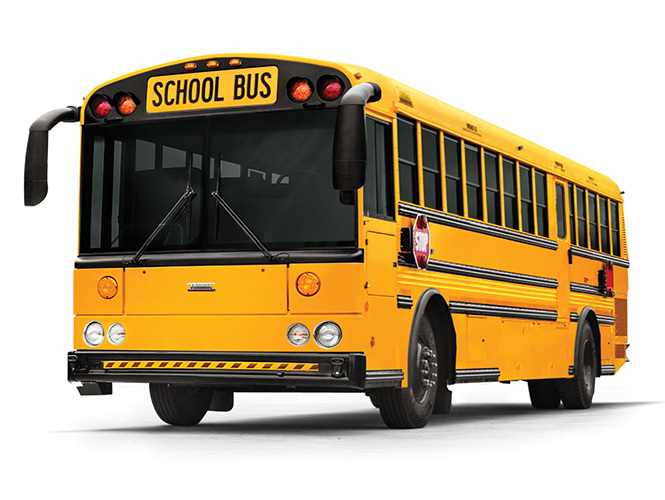 And because safety is important to everyone, each HDX school bus meets or exceeds FMVSS and CMVSS. Finally, to help you keep your HDX buses safe, efficient and comfortable, Thomas Built developed one of the most extensive dealer networks in the industry.